On March 20, 1968 Promoter Ed Francis presented a professional wrestling card at the Honolulu International Center Arena which featured two championship matches and three supporting matches. 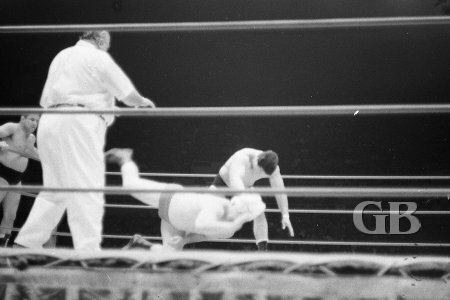 In the opening match, Jim Hady used a Sleeper Hold to defeat Fritz Von Goering. 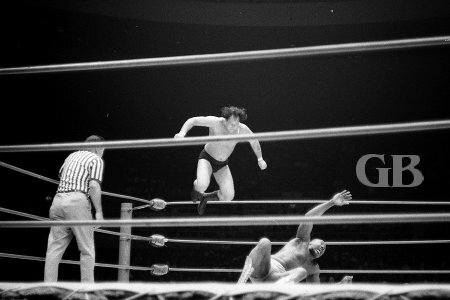 The next match featured Ray Stevens and a masked Ripper Collins against the team of Pepper Gomez and Hahn Lee. The reason Collins was wearing a mask was that a week earlier Collins lost a "Loser Will have his head shaved in the ring" match against The Missing Link and Collins started wearing a mask stating that "fans will not have the pleasure of seeing me bald. 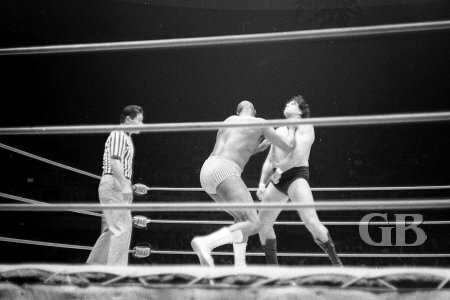 As for the match itself, Collins used a body press on Hahn Lee to give him and Stevens the victory. 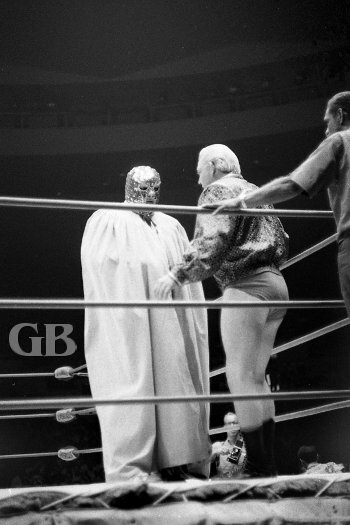 A masked Ripper Collins teams with Ray Stevens. 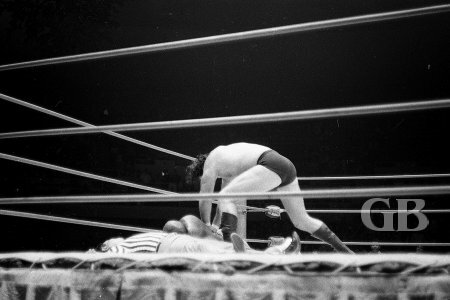 Ray Stevens works over Hahn Lee while Ripper distracts the ref. In the second tag team match of the night, Peter Maivia and Neff Maiava defeated the team of Killer Kowalski and Angelo Poffo. Hahn Lee has Ray Stevens at his mercy as Pepper Gomez looks on. Stevens tightens his face lock on Pepper Gomez. Hahn Lee throws Ray Stevens face first into the mat. 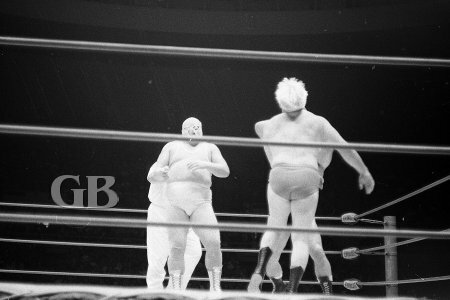 Pepper Gomez takes on both opponents in the middle of the ring. Angelo Poffo gives Peter Maivia the boot. Killer Kowalski body slams Peter Maivia. 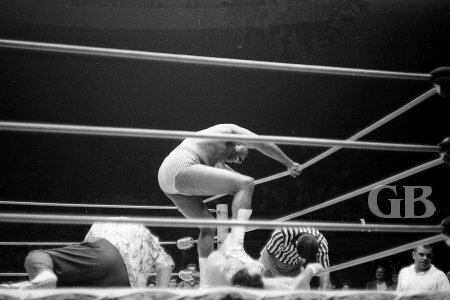 In the first championship match of the night, Curtis Iaukea retained his Hawaiian Heavyweight title when he and the Missing Link were both disqualified for fighting outside the ring. 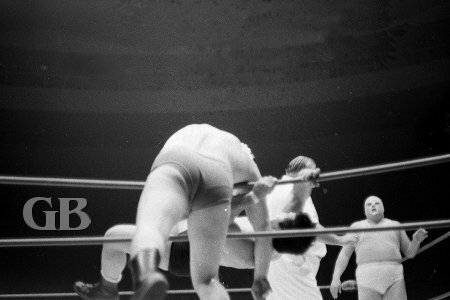 Pampero Firpo, the Missing Link, applies his famous Bear Hug on Curtis Iaukea. The main even saw Johnny Barend retain his United Stated Championship when Bearcat Wright was disqualified for using his head as a battering ram and headbutting both Barend and the referee after each wrestler had split the first two falls. Bearcat Wright delivers an vicious chop to a stunned Johnny Barend. Wright tries to escape Barend's lethal knee drop from the top ropes. Barend has both Bearcat Wright and the referee down on the mat. 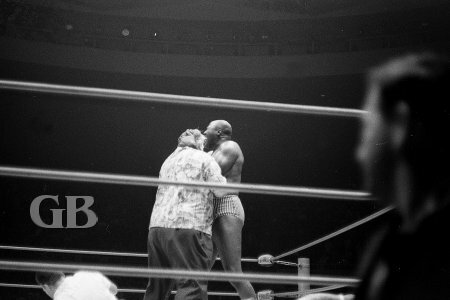 Bearcat Wright about to headbutt off duty referee Frank Merrill. The Bearcat has everyone down: Johnny Barend and two referees Wally Tsutsumi and Frank Merrill.